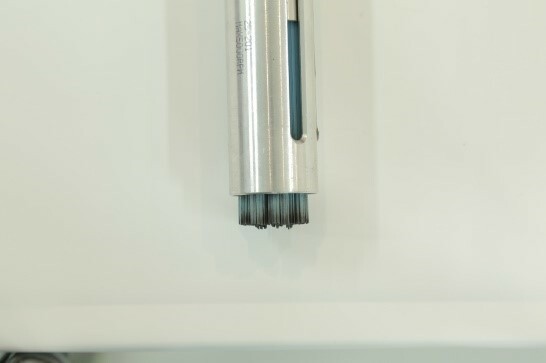 XEBEC Brush™ Surface Maintenance | メンテナンス方法 | XEBEC TECHNOLOGY CO.,LTD. When the brush is worn out unevenly, you can form the tip of the brush using a diamond disc blade. Use a drilling machine or lathe. If you want to cut off the brush, cut from the side of the brush using a diamond disc blade and sever it. Always wear protective goggles, gloves and masks when operating the tool. Wear long sleeves, tight cuff, and clothing to minimize skin exposure. 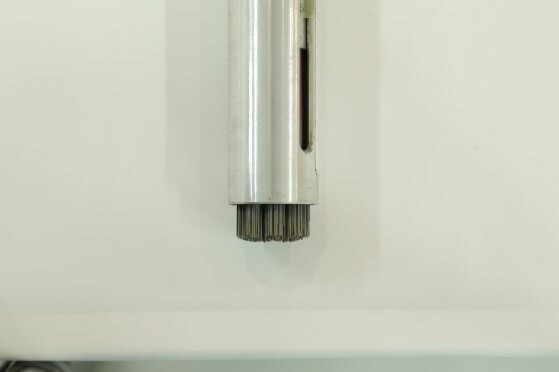 Cutting particles and burrs may scatter within an area around the work as the brush rotates. Stay clear of this area. The area around your work is hazardous in case flying pieces of fiber rods from the tools and grinding powder may scatter, enclose your working area to prevent other people entering, or have the people surrounding your work area protective equipment as well. Follow the precaution in use and safety measures for operators above without fail. If you fail to observe them, there are following risks. ■ A tool or a part of a tool may crack, drop off, distort or break. ■ Broken pieces of a tool or grinding dust may stick into your skin, or at worst stick into yours eyes, causing blindness. ■ Dust generated by machining process may bring up skin irritancy or allergy.